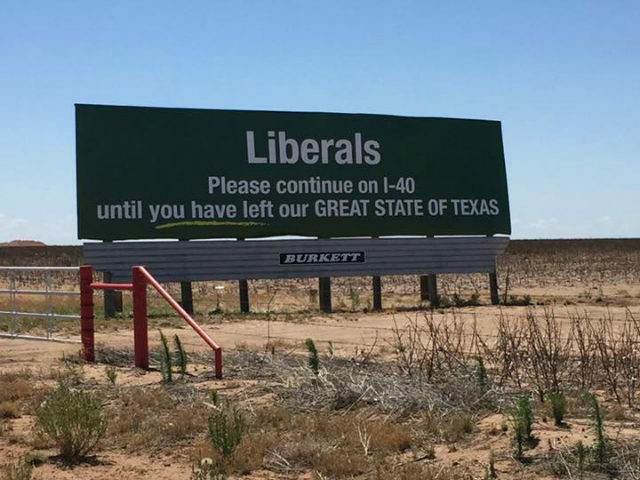 A photo of a Texas billboard is gaining a lot of attention on social media because of its message telling liberals to keep driving until they leave Texas. Mccallie’s photo, which was uploaded Tuesday, amassed 14,000 shares as of Wednesday morning. Mccallie said he saw the billboard six miles east of Vega, a city with an estimated population of 880 and located 35 miles from the New Mexico border, while driving along a route he usually travels for work. Mccallie told USA Today he does not know who is responsible for the billboard but says he supports the sign’s message. He has gotten pushback from those who disagree with the sign’s political message. “Someone please get this trash down, thanks!” one commenter wrote. “This sign doesn’t represent the state of Texas. Just a group of redneck republicans that can’t let go of the fact that the state is progressing with or without them,” wrote another Facebook user. While Mccallie received a lot of criticism for his post, others wrote messages of support and defended the advertiser’s freedom of speech. “Born and raised in Texas and love this sign! !” one user said. “Freedom of speech! How can one sign represent a whole state and the people in it! But here we are! I was born and raised here! I do not know one person in my family who feels we should divide as a country!” wrote another user. It is unclear who bought the billboard, how much money the purchaser spent on it, or how long the billboard has stayed up. Breitbart News reached out to Burkett Outdoor Advertising, the company reportedly responsible for selling space to the advertiser on the billboard, for comment by phone. Its website was down as of Wednesday morning due to technical problems.